Well, I used to love pillows. Then I learned from the Vanderbilt ASAP clinic that I have a dust mite allergy…a really, really severe dust mite allergy–one of the worst they’ve ever seen. Guess where dust mites live? Pillows. Mattresses. Upholstered furniture. Carpet. Those yellowish stains on your nice, soft feather pillows? Not sweat. Dust mite detritus. In other words, dust mites love soft things, just like we do. To make matters worse, dust mites love soft, breathable, organic fibers like cotton; unfortunately, so do I, since I am allergic to the chemicals used in the manufacture of synthetic fabrics, too. The docs recommended I eliminate all fabric from my home except for my mattress and bed pillow, which should be covered in synthetic, plastic, zip-closure things that essentially suffocate the dust mites and provide a protective barrier between mighty-mites and me (sounds comfortable, right?). Sputtering, I responded, “What am I supposed to have left in my house?” They recommended hardwood or tile floors (Yay!) and (drumroll, please) metal or plastic furniture. WHAT??!?!?! Although I did buy the mattress and pillow enclosures (and have been pleasantly pleased, especially now that they have extra soft ones at Bed, Bath, & Beyond! ), I thought they were asking a bit much. After all, I currently live in a 90% carpeted condo, so I can’t exactly rip up the homeowners’ carpet and say, “My allergies/doctors/voices in my head made me do it.” Plus, who doesn’t want a comfy couch? With comfy pillows? And comfy ottomans? I used to work at Pier 1 Imports. Not once did someone enter the store and say, “Where are your plastic throw cushions?” or “I’m looking for a nice, metal couch.” Not many people are screaming for a metal or plastic couch…at least, I don’t hear any. That was in November 2011. Since then, I see dust mites everywhere (no, you can’t actually see them without magnification), but I have visions of them propagating and march-running over the swells of the sofa like orcs in the Lord of the Rings trilogy. I’ve started labeling anything potentially dust mite-laden or a dust-collector as a “dusty.” With so many dusties around the house contributing to my ill-being, I willingly sacrificed two trash bags of throw/accent pillows dusties to Goodwill. This was before I read online that you could slow dust mite reproductive cycles (and facilitate die-off) by freezing your pillows (and anything you can’t machine wash and dry on hot) in sealed, plastic bags like those giant Ziplocs for over 24 hours. I knew that keeping your home colder (below 68 degrees) limits their reproductivity, but this was news to me. Wait, I didn’t have to give those pillows away?!?!?! Eh, whittling down my supply of pillows was probably wise; after all, I still have 11 dusties toss pillows remaining in various locations around our home. 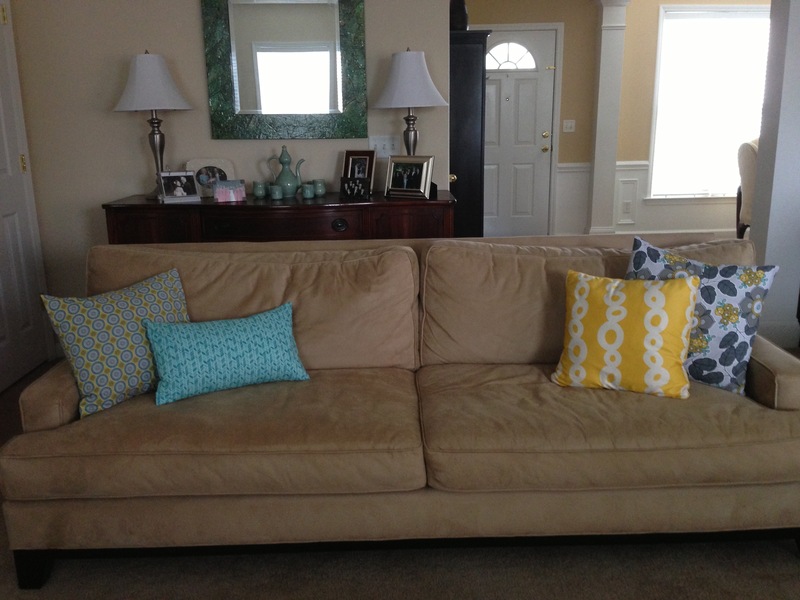 Plus, some of those pillows would have been hard to cover (dark colors, bold florals, textural). What pillows I have remaining are definitely my favorites, but they could still benefit from updating. Since my decorating style is rather eclectic, and I get bored with the same old, same old rather quickly, I decided to make some envelope enclosures for my existing pillows. This way, I can easily remove the covers, wash them (those of you with kids are nodding, right? ), and change out according to season, design whim, etc. 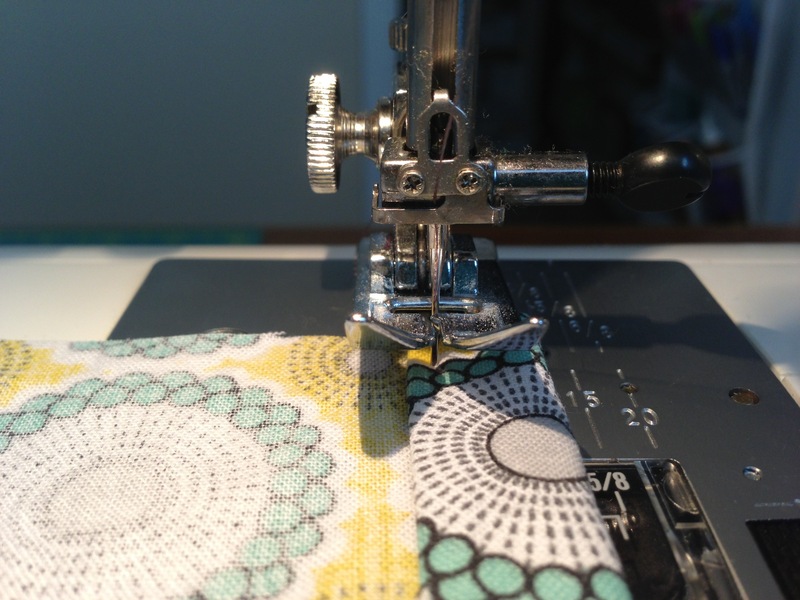 There are several websites and blog posts about making envelope pillow covers that necessitate varying degrees of expertise and patience needed to decipher, read between the lines, and follow the directions. I’ve listed some options below, but there are plenty of other good tutorials out there! I Heart Stitching: Love the listing of fabric dimensions for different pillow sizes. Directive rambling? Not so much for me, but this could be useful for a lot of people (lots of calming reassurance). Best part, IMO? The most disturbingly stained ironing board I’ve ever seen. I love it when we see the human side of amazing DIY people! 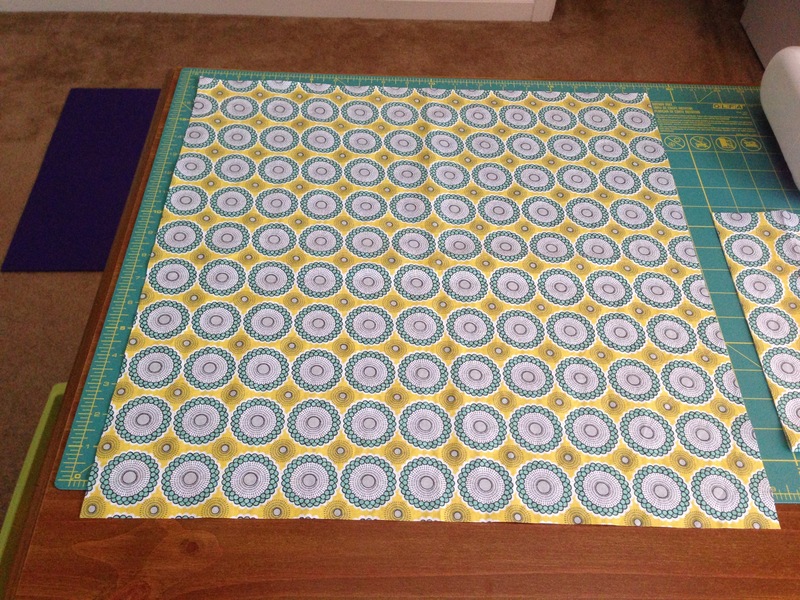 Step 1: MEASURE AND CUT FABRIC. Measure and cut your front panel. For an 18 in x 18 in pillow, I cut a 19 in x 19 in front panel, allowing the extra 1 inch requisite that these tutorials recommended. Then measure and cut your back panels (shown in pic), which for me were 19 inches long (to be as long as my pillow front) x 12.5 inches wide each (I followed the Tatertots & Jello calculation here). Step 2: SEW BACK PANEL OPENING EDGES. Fold the opening edge of one of your back panels under once (1/2 inch) and once more (another 1/2 inch). The opening edge is the side of the panel that will be open in the middle of the back so you can stuff your pillow inside the cover. Pin and sew those edges, backstitching at the beginning and end for strength. Rinse and repeat for the other back panel. Step 3: SEW FRONT AND BACK PANELS TOGETHER. This is where you can totally ruin your project if you aren’t careful. Lay front panel sunny side up (pretty side facing up). Lay the two back panels sunny side down on top of the front panel, making sure your outside edges match up so that you have the right amount of overlap in the middle of the back. 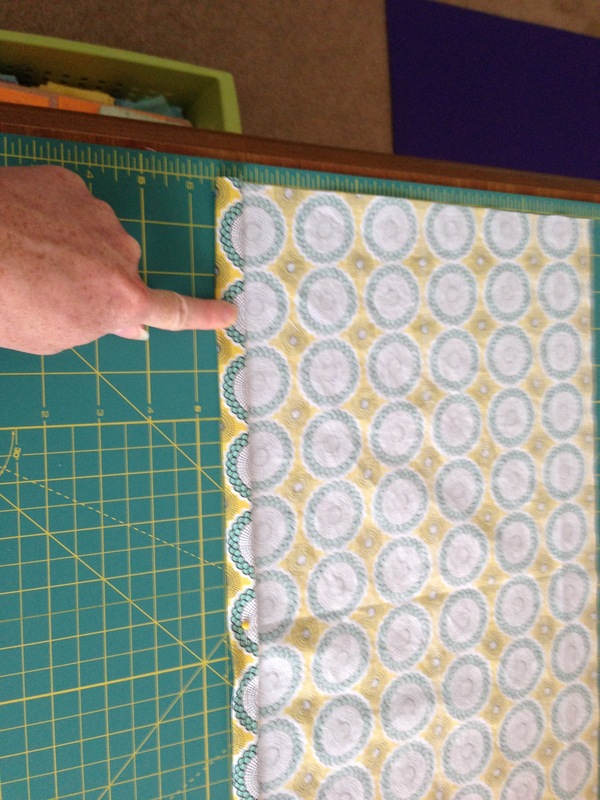 Pin and sew around the entire perimeter (outer edge) of the pillow cover, leaving about a half inch allowance (margin). Backstitching at the beginning and end of your sewing is a must, and some people recommend backstitching over the corners and the area where the opening will be to reinforce the pillow (rule follower that I am, I did!). Step 4: INVERT, STUFF, AND PLUMP. Now turn your pillow cover right side out through the opening, and stuff with pillow form or old pillow. Voila! 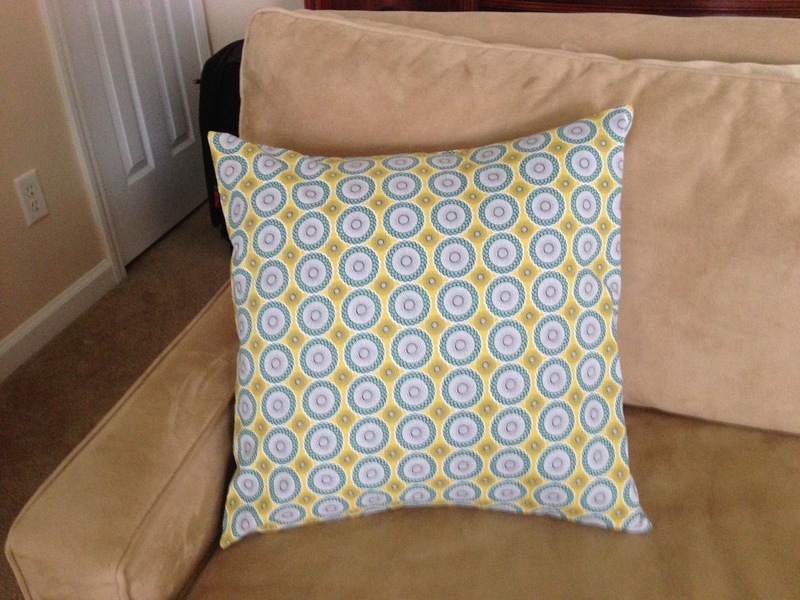 Once I did one pillow cover, I couldn’t stop. The yellow pillow with the white chunky chains is from Target; the other three are pillows wearing my envelope pillow covers. Yay! 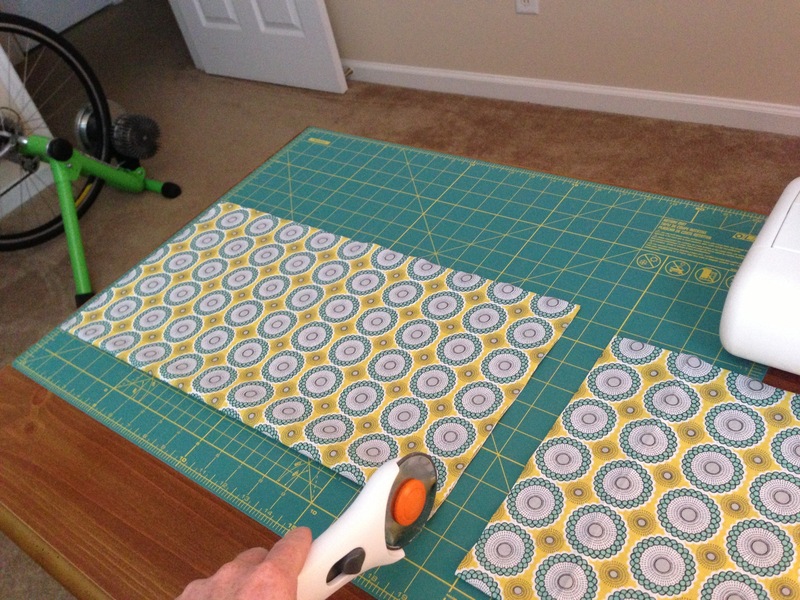 If you cut your fabric an extra inch in dimensions, as recommended by these tutorials, you may have a pillow cover that is a bit loose if your pillow form or existing pillow doesn’t fill it out completely. Even when a pillow’s label says “18 x 18” you may have extra room in your 19 x 19 cover. 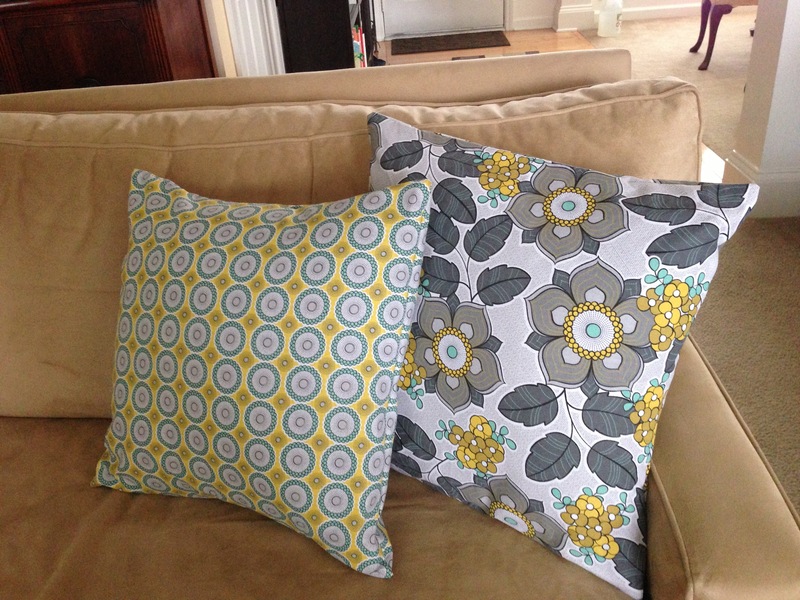 In fact, I made a 19 x 19 pillow cover for an 18 x 18 pillow and managed to get a 19.5 x 19.5 pillow (the gray floral) inside it to get the form to be snug and crisp-looking. I wouldn’t recommend this necessarily, though, because you don’t want the back opening to pucker, or worse, rip your brand-new pillow cover. The back of mine doesn’t pucker but is close. I tried a half-inch allowance for another square pillow, and that turned out to be just perfect, possibly because my pillows aren’t as plump as other people’s pillows (insert adolescent male joke here). For a rectangular shape, I recommend the full inch allowance, as stuffing the pillow through a smaller opening is a tougher job, and you may need extra room inside for properly positioning the pillow (try to say that five times!). Also, on the rectangular form, you don’t need as much overlap in the back panels. 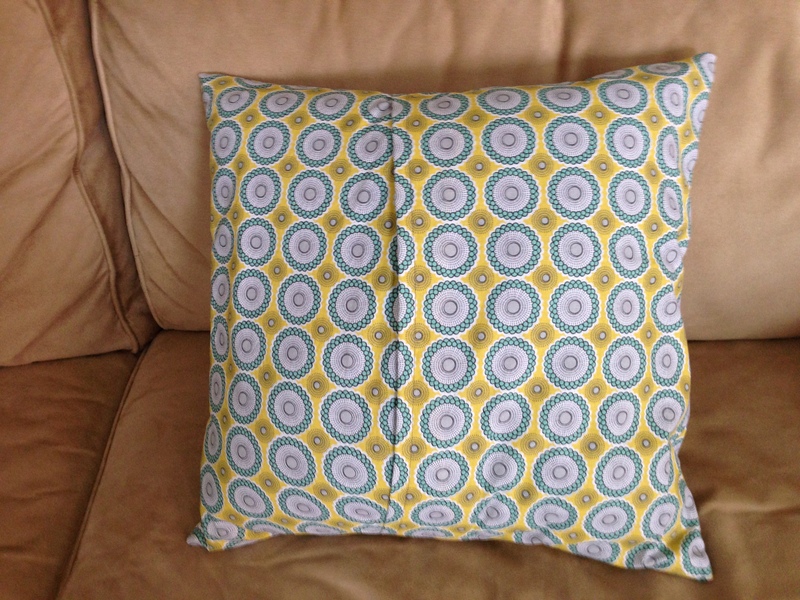 In fact, that much overlap makes it REALLY difficult to get the pillow inside.